Today I have a card over on the Hero Arts blog. It features some of their cute digital cut files for the Silhouette. 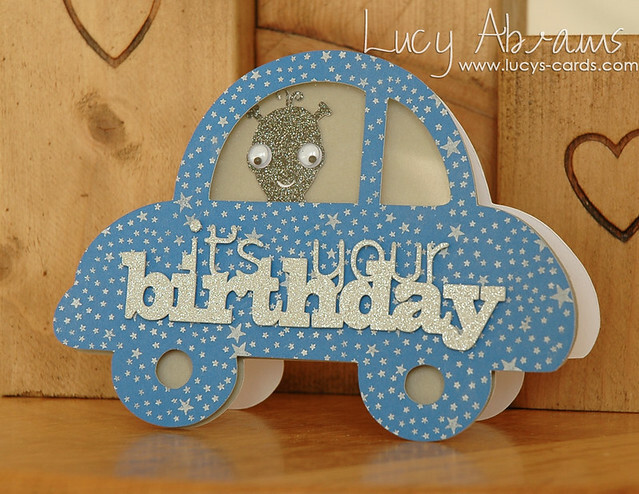 I used a car from the Mixed Silhouette Shapes set, a cute Alien and the 'It's Your Birthday' sentiment. These cut files make shaped cards soooo easy to create! I cut the car from paper stamped with the Tiny Star Background stamp. I used Silver Shadow Ink (which I LOVE!) and matched it up with some glitter cardstock from THIS pad. You can get all the details and instructions on this card HERE. Wow this is so cute!!!!! That is a cute card, my boys' would love it!